RESIDUE WARNING: DO NOT FEED TO CHICKENS PRODUCING EGGS FOR HUMAN CONSUMPTION. ZERO-DAY WITHDRAWAL PERIOD. DO NOT USE IN LOW CALCIUM FEED CONTAINING LESS THAN 0.55% DIETARY CALCIUM. USE IN SUCH FEEDS MAY RESULT IN VIOLATIVE RESIDUES. RESIDUE WARNING: DO NOT FEED TO CHICKENS PRODUCING EGGS FOR HUMAN CONSUMPTION. 24 HOUR WITHDRAWAL PERIOD. DO NOT USE IN LOW CALCIUM FEED CONTAINING LESS THAN 0.55% DIETARY CALCIUM. USE IN SUCH FEEDS MAY RESULT IN VIOLATIVE RESIDUES. RESIDUE WARNING: DO NOT FEED TO TURKEYS PRODUCING EGGS FOR HUMAN CONSUMPTION. RESIDUE WARNING: DO NOT FEED TO TURKEYS PRODUCING EGGS FOR HUMAN CONSUMPTION. ZERO-DAY WITHDRAWAL PERIOD. RESIDUE WARNING: 5-DAY WITHDRAWAL PERIOD AT 10 MG/LB. DOSAGE. RESIDUE WARNING: ZERO-DAY WITHDRAWAL PERIOD. RESIDUE WARNING: THIS DRUG PRODUCT IS NOT APPROVED FOR USE IN FEMALE DAIRY CATTLE 20 MONTHS OF AGE OR OLDER, INCLUDING DRY DAIRY COWS. USE IN THESE CATTLE MAY CAUSE DRUG RESIDUES IN MILK AND/OR IN CALVES BORN TO THESE COWS. RESIDUE WARNING: THIS DRUG PRODUCT IS NOT APPROVED FOR USE IN FEMALE DAIRY CATTLE 20 MONTHS OF AGE OR OLDER, INCLUDING DRY DAIRY COWS. USE IN THESE CATTLE MAY CAUSE DRUG RESIDUES IN MILK AND/OR IN CALVES BORN TO THESE COWS. 5-DAY WITHDRAWAL PERIOD AT 10 MG/LB. DOSAGE. For Honey Bees: For control of American Foulbrood caused by Paenibacillus larvae and European Foulbrood caused by Streptococcus pluton susceptible to oxytetracycline. 0 days for swine and turkeys. 0-5 days for chickens and cattle. Meal feed medication with high flowability for use in micro-metering machines. Ingredients: Oxytetracycline dihydrate base, calcium carbonate, roughage products, mineral oil. 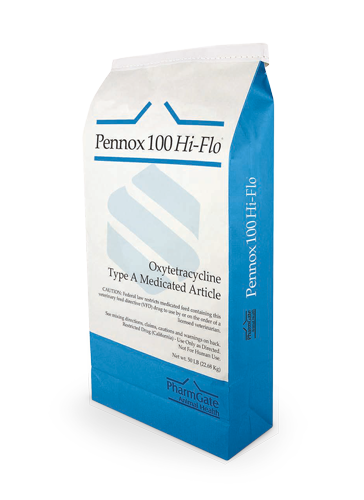 Type A Medicated Article for use in the manufacture of medicated dry feeds (not for use in liquid feeds). Category I drug; does not require a feedmill license.